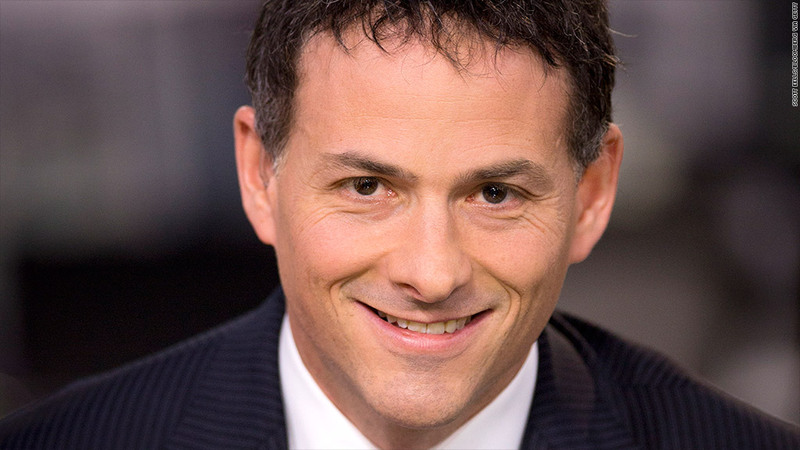 Hedge Fund titan David Einhorn triggered a tsunami of skepticism about athenahealth this week by arguing the company's sky-high valuations are a sign we're in the midst of another tech bubble. But at least one portfolio manager remains bullish on the health care record provider. She bought the stock after Einhorn's comments caused it to tumble this week. Cathie Wood, founder and CEO of ARK Investment Management, believes athenahealth (ATHN) is in the "sweet spot" to help the $3 trillion health care industry become more efficient by tapping cloud technology. "Companies with strategic vision as they move into the cloud tend to take the lion share of the market. They move very rapidly so no one can catch them. We think Athena is in that category in the health care space," she said. Wood, who previously worked at AllianceBernstein (AB), said she purchased athenahealth at just $30 in 2009 or 2010 and watched as it skyrocketed as high $206 in March. She scooped up more shares of athenahealth on Tuesday when it fell below $110. "The thing about bubble stocks is the best reason to own them is because they are going up," Einhorn said during a presentation at the Sohn Investment Conference. "When they stop going up, these stocks become falling knives." The hedge fund billionaire's bearish call sent athenahealth tumbling 14% on Tuesday to $109 and then below $101 on Wednesday. He argued the stock could plummet as much as 80%. "I can understand why people think it's at an outrageous multiple," Wood said, acknowledging athenahealth's surreal valuation of over 100 times projected 2014 earnings. By comparison, the Nasdaq 100 trades at about 18 times estimated earnings. "They decided to dial down earnings by increasing costs to invest in the business more aggressively," Wood said. Instead of price-to-earnings ratios, she said a better way to value athenahealth is based on its projected 2015 revenue of $1 billion. On that basis, the stock is selling at a multiple of about four, compared with higher multiples for LinkedIn (LNKD), Facebook (FB) and Twitter (TWTR). "Athenahealth has one of the biggest opportunities in front of it and is one of the cheapest stocks on that basis," said Wood. Wood compared athenahealth with Amazon.com (AMZN), which she purchased shares of in 2001 when the e-commerce giant was valued at just $5 billion, compared with $137 billion today. 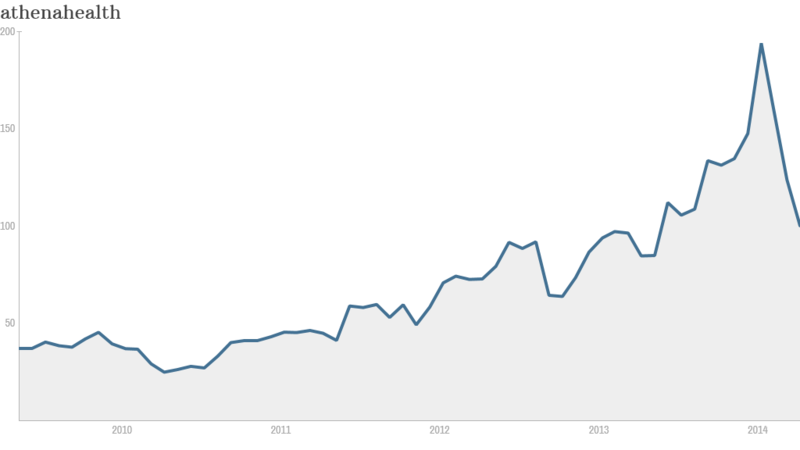 "Never during that time period would you have gone near that company based on a P/E ratio. You bought it because you understood how far ahead of the pack it was in pushing retail into the cloud," she said. Wood also defended athenahealth CEO Jonathan Bush, who Einhorn poked fun at on Monday by showing a video montage of the animated executive that drew laughs from the audience. "He is irreverent, to be sure. That's one of the things I like about him. What you see is what you get. I think he's been an amazing leader of this company," said Wood, who has met with Bush in the past. Einhorn's bearish call on athenahealth stands in contrast with bullish bets from a slew of big-name mutual fund investors who are among the company's biggest investors. This includes funds run by Fidelity Investments, T. Rowe Price Group (TROW) and Morgan Stanley (MS).